Create your titles with banners in new Title Type /look the pic.1 below/. The graphic should be with animations, meaning the title will auto close when it is finished. Before the movie, add the new command Run Title by Type /look the pic. 2 below/. That command will run by random a title from the specified type, with specified startup offset and specified time interval between run of 2 titles. When the command is run in Manual mode, it requires a Stop command to run off the mode. 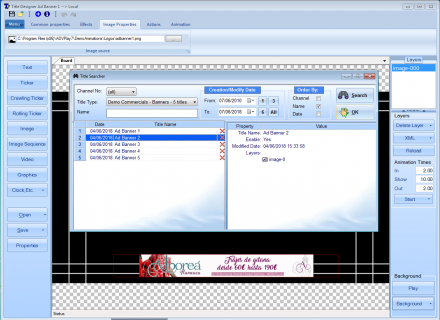 You may attach MyCommand that contains the command Run Title by Type as a permanent MyCommand to the video file. In that way, when the video file is added in a playlist, it will auto turn on that mode, when the file is finished it will auto turn off and this will save a lot of time in the everyday scheduling! As many others, that feature is demonstrated with our DV Play DVD and the Demo playlist available for free download. We encourage all potential customers to download the DV Play DVD and to test that and other features with opening the Demo Playlist. Title Type The list of titles that will roll up randomly. The list of titles that will roll up randomly. Run Title By Type The banners will be auto run in random order while those 2 video files are played. The banners will be auto run in random order while those 2 video files are played. 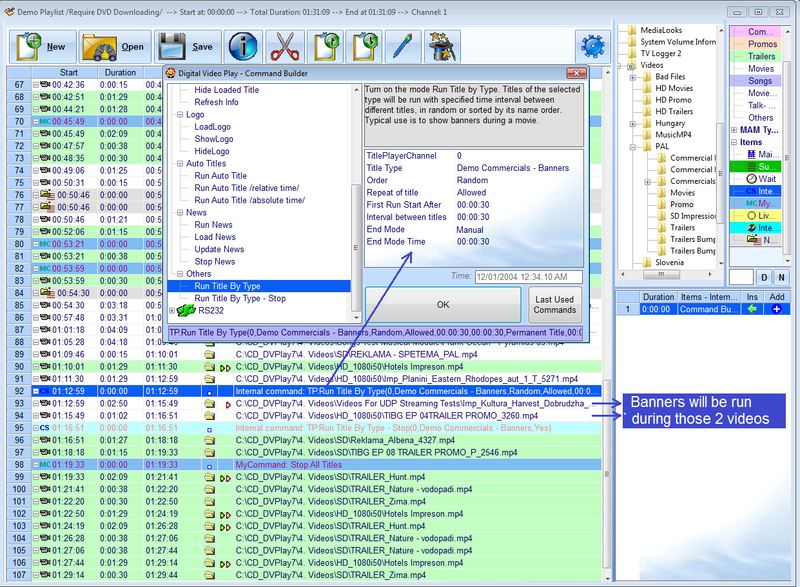 Run Title By Type - Report When the execution is finished, you get a detailed report which banners have been run. When the execution is finished, you get a detailed report which banners have been run. Test Run Title By Type with DV Play DVD & Demo Playlist If you download the DV Play DVD on the Row 27 in the Demo playlist you could find the Run Title By Type command set as a permanent MyCommand. If you download the DV Play DVD on the Row 27 in the Demo playlist you could find the Run Title By Type command set as a permanent MyCommand.